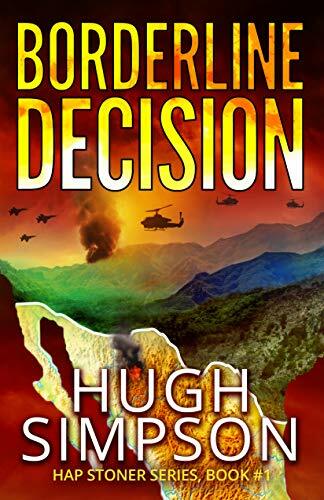 BORDERLINE DECISION by Hugh D. Simpson Synopsis Deadly alliances between Mexico’s most powerful drug cartel, Black Stone and their mysterious Middle Eastern collaborators spill across the US/MX border leaving an unknown American brutally assassinated followed by an ambush of a US Marine Observation Post, and leading to the capture of LtCol Hap Stoner’s Commanding Officer, LtCol Chuck Warden. With a stubborn streak that’s as big as his heart and as strong as his loyalty to country, family, and his fellow Marines, LTCOL HAP “KANG” STONER leads his squadron of Marine Aviators on an unauthorized mission into Mexico to bring Warden home. US Marine LTCOL “TUNA MAN” WARDEN is a high-value prisoner, an American warrior infidel - whose head will bring a high price for a certain American Senator and the Black Stone cartel. Disgusted by the US Administration’s inaction and recriminations of Tuna Man, Hap leads the Nomads to save his CO’s life while barely staying ahead of his nemesis, Group Commander COLONEL TED SHANK. A Careerist, Shank will do anything, step on anyone to get a star. Colonel Shank works with a corrupt Senator, who chairs the Armed Forces Service Committee. Without US approval, Hap reaches out to his longtime friend, THOMAS “BLAD” LEFFLER and Will Kellogg. Blad, retired from the USMC, has joined forces with the mysterious founder of SHADOW SERVICES INTERNATIONAL, a privately held global intelligence network. Will Kellogg is a former Recon Marine, CIA Operative, former business partner, and casino owner in the Caribbean island of San Andres Columbia. In their initial phone conversation, Hap and Blad realize their missions overlap as Blad discloses that he is missing an agent, SHADOW 28, who was tracking cartel activity along the border - specifically human trafficking. Recently, six teenaged girls disappeared from Phoenix Arizona and now it appears that they and Shadow 28 are victims of a Cartel kidnapping. He and LtCol Warden are being held in a secret jihadist compound deep in the cartel’s territory, a location unknown to those ready to launch the rescue mission. Still entrenched in his CIA roots, Will Kellogg contracts out to various countries and companies around the world. Meanwhile, Marine Corps Commandant, GENERAL RUSS VERBIE testifies before the Senate Armed Services Committee defending the actions of LtCol’s Warden and Stoner. However, Col Shank counters Verbie’s testimony under orders from corrupt SENATOR SCOTTY JOURDAN, head of the SAS Committee, who has been making a fortune for himself by conducting illegal business with the head of the drug cartel, known as the “SCORPION.” With help from a number of former combat vets, Hap and the NOMADS elude the feds and embark on a rescue mission to bring back the missing girls, Shadow 28, and LtCol Warden. The action rises during an air attack on Scorpion’s remote cartel ranch, also a training camp for jihadist recruits. Although casualties on both sides are high, the Marines are successful: high-level captives are in custody and the severely wounded are jammed onto one overloaded helicopter for a treacherous emergency transport back to a U.S. hospital. To capture Scorpion, Hap, Blad, Will Kellogg, and their team move in for a dangerous night insertion into Mexico, where they meet up with Blad’s tough female operative ZAIDA, aka Shadow 86. They breach the cartel leader’s posh Mexican resort with Zaida’s invaluable intel and aid. While an ongoing firefight ensues, Hap angrily confronts traitorous Senator Jourdan, a guest in Scorpion’s private penthouse suite, elicits, and secretly records his confession on his phone. After a perilous rooftop battle, a wounded Hap and his battered Marine squadron, who barely escaped with their lives, now must head for home to face the wrath of US officials. CARLA MCCREERY, Hap’s smart, feisty live-in attorney girlfriend, and a top legal team, along with Hap’s very persuasive recording of the Senator’s confession, implicating both Col Shank and Jourdan; turn the tide for the Marine Aviators. Combined, it is a strong enough incentive package for Shank to release and honorably discharge the NOMAD Marines from Marine Corps service. At Hap’s ranch in Texas, Carla nurses Hap as he recovers from his injuries sustained in the firefight at the resort. It’s a well-earned vacation until a mysterious visit with a message from Blad, followed by a phone call from Will Kellogg sets up Hap and the now-discharged NOMAD Marine Aviators, along with Shadow operatives for their next adventure.